Engaging in activities such as this with a group usually finds me on my own less than five minutes within arriving. I always notice this, and have occasionally wondered about it. Whether it be shopping, touring a museum, apple-picking; visiting a used car lot, brewery, or snack bar, I can’t help but wind up on my own as others pair or group off. (Insert romantic dream-like answer to this unspoken question here, which manifests itself into my soul mate and life-strolling partner, despite actively searching for him or not.) And so I found my pace: examining beaded necklaces, Depression glass and signs; passing by rifle paraphernalia, turning my nose up at overpriced lunch boxes, and stopping to greet each friendly dog in attendance (except Pugs, sorry). I passed by my mom and my aunt once or twice, discussed the location of the best donuts with my dad, and saw my brother and sister-in-law a couple rows away during the course of the morning. I could only get myself half interested, not finding much that inspired me, only going back to buy a couple items out of slight boredom. It was towards the end of the last row when my Aunt Kathy approached me with a treasure. Here’s what I know, mixed with what I’ve gathered: Someone, who I think was a girl, set out to write a book. She began with a blank Composition book, gave her work a title (Gifted Girl) decided on an outline of at least seventeen chapters, with corresponding illustrations. As was customary, (until when?) she was planning on listing her illustrations just after the table of contents, along with a caption (or quotation, as she wrote it). The handwriting is not something you would not see in any type of American school, at any level. It resembles the model cursive that hung above the blackboard in every grade I attended before high school. 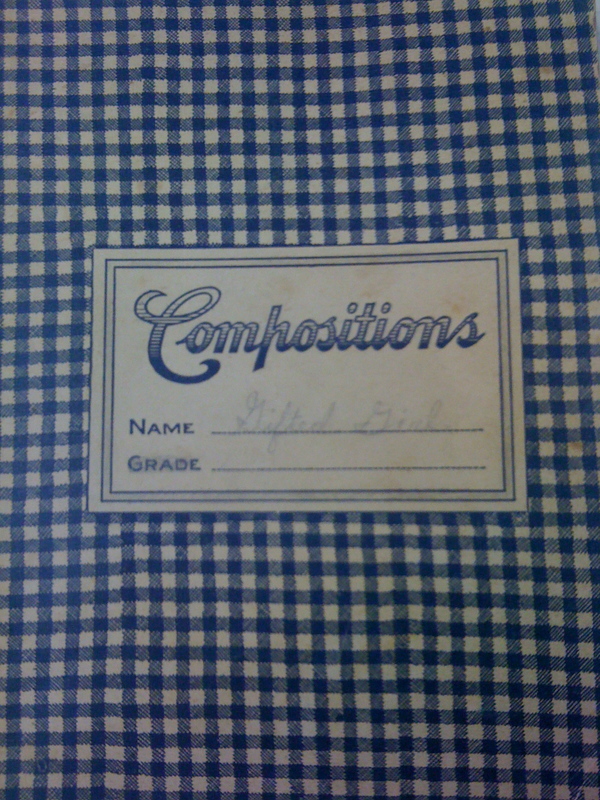 Four chapters are written in the composition book, although I have no way of knowing if the last one is complete. The rest of the book is empty, except for two pages: one “Serena’s Love Scenes– Final” and the other is a sketch of a Colonial house among trees, underneath which it reads “Our Home / firstname lastname ’40” Now. I am fairly positive the first name is Dorothy. The last name, however, is up for debate. Howes? More on that later. So, in honor of my Aunt Kathy’s birthday (yesterday) I decided it was time to begin this project. I took some photographs of the book, began to think about how I could use this format to do it (as much as I can) justice, and maybe find out who wrote the beginning of Gifted Girl. I will begin typing her first four chapters soon, and will welcome any creative input to help give Penny some direction and new life. This entry was posted in flea markets, Gifted Girl and tagged flea markets. Bookmark the permalink. Jenny, this is incredible! How did I not know about this? Oh, there’s so much I want to say… like what a cool thing to happen to a writer. And how desperately I want to see this book and its model handwriting and sketches and unfinished story. This is the last thing you want to read: but I almost feel like a separate blog devoted to this project is in order. I’ll shut up now. I am DYING to see what happens with this – excited to see your scans/pictures and to watch this project take shape. And I’m sending this link to a writer friend who is totally going to eat it right up! What a wonderful idea for a project. I wonder how many of these lost books are at flea markets all over the country? So many unfinished stories and characters. These details must inspire imagination!